Reading My Way Through Life: Spring Reading Thing - Done! It will probably come as no surprise that I'm signing up for a Spring Reading Challenge. 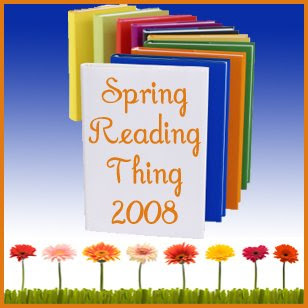 What: Spring Reading Thing 2008 is a casual, low-pressure challenge. There is no required number of reads to 'reach'. Just make a list of books you'd like to read (or books you'd like to finish!) this spring. When: I bet you can guess: Spring 2008. The official dates are March 20th through June 19th.